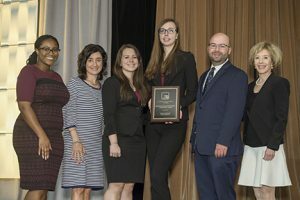 The University of Pittsburgh School of Pharmacy was awarded the Creative Inter-Professional Team Event Focused Award in the Sixth Annual Script Your Future Medication Adherence Team Challenge at the 2017 AACP Annual Meeting in Nashville, Tennessee. Pitt Pharmacy Class of 2019 competed against 65 other health professional schools from January to March 2017. The purpose of the challenge was to reach out to people in the community in order to raise awareness about the importance of medication adherence. PittPharmacy students reached 1,150 patients at various community sites and events. Throughout the competition, the pharmacy students were able to engage other professional schools at Pitt to expand their roles and knowledge about medication adherence. PharmD students Jesse Valentino, Annie McAndrew, and Erika LeBakken presented information about medication adherence to occupational therapy students regarding ways pharmacists can work together with occupational therapists to promote adherence and overall wellness. An article was published in the School of Social Work’s newsletter emphasizing the importance of adherence and its role in patient care. Medical and nursing students were trained on how to assess a patient’s level of adherence and provided resources on how to improve adherence.